Michael Cordova ~*shined*~ as we got to know him. It's not every day that you get a chance to meet doppelgangers. 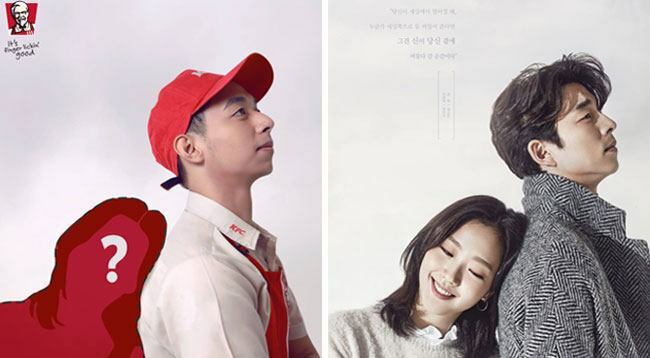 Since we failed last time to see KFC's Gong Yoo lookalike IRL, we couldn't let another opportunity pass, and luckily, the gods obliged! 1. He's studied both multimedia arts and hotel and restaurant services. He took a hotel and restaurant services course offered by TESDA after becoming interested in the food industry. Prior to that, he studied multimedia arts in ACLC for two years since he was into computer gaming. After finishing it, he applied at KFC and has been with the company ever since. He's been assigned to other branches aside from the one in Vista Mall. 2. He was at work when his photo went viral. Michael was on his closing shift when the photo was uploaded and shared by the internet. When he reached home, his neighbors teased him, "Michael, sikat ka na!" and he checked Facebook right away. 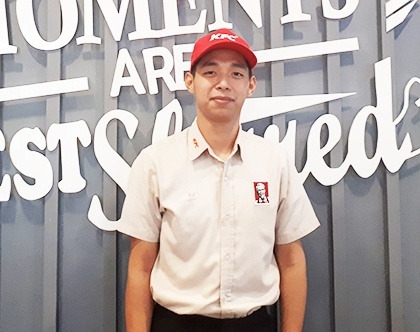 Lo and behold, he got the shock of his life after being tagged so many times by friends and coworkers from KFC and receiving countless messages about it. "'Di ko alam kung matutuwa ako o ano eh. 'Di ako makapaniwala—natahimik nga lang ako 'nun eh." Aside from the photo shoot he had for the KFC promo announced on June 22, he still worked as usual. He hasn't really seen the entries to the promo—photos of women with an uncanny resemblance to actress Ji Eun Tak and others with images just hilariously trolling the post. "Syempre, 'di ka sanay," he says. "Ang layo sa realidad ng buhay eh—simple lang naman ako." 3. He's been getting some attention since Train to Busan. Since then and especially now, people have been asking for selfies with him. Sometimes, he wishes people would order food first before they ask to take a selfie with him. But he's truly surprised since so many people have been going all the way to the remote branch to see him. 4. He has a girlfriend. His girlfriend of two years was the first person he called when the whole thing erupted, and both of them were overwhelmed and just didn't know what to do. Michael said she isn't really getting mad or anything about all the attention he's getting, but when asked if he thinks she's jealous, he quipped, "Baka po, deep inside." LOL! 5. He's really thankful for the support and blessings he's getting. Michael's family is super proud, and even his relatives from the province and abroad are sending him positive messages. Aside from these special people and the others that aren't hating on him, he has one person he's really grateful for. "Gusto kong magpasalamat d'un sa nag-upload [nung picture ko]. Sa nangyayari sa'kin—lahat ng 'to ngayon—siya 'yung nag-umpisa noon. Sobrang thankful ko sa kanya." He and Eriel haven't met in person yet, but he shares that they have gotten in touch on Facebook. 6. He's a humble guy who's just going with the flow. Every moment with Michael ~*shined*~ because he was such a polite and humble person IRL! He never dropped the "Ma'am" throughout our interview! He tells us how much he gets taken aback whenever customers approach him for a photo. He thinks to himself, "Pagbibigyan ko ba? Baka sabihin mayabang ako," and sometimes, he gets totally speechless. He shared that it's far from his college days when he could jokingly say, "Mas gwapo pa ko diyan eh!" and just laugh it off whenever classmates teased him about looking like Gong Yoo. When asked if he's open to pursuing a career in entertainment, he said "Okay lang po, 'di ko naman ginusto pero basta, I try my best [whatever opportunity comes]." But he clarifies that he doesn't have plans of leaving his job at KFC soon, and he has always been thankful for his employer. He shares, "Bigla na lang dumating 'to—ambilis ng mga pangyayari. 'Di ako handa. Sumusunod na lang ako sa agos ng buhay. Kung ano mangyayari sa'kin ngayon or bukas, kung sikat pa ba 'ko o hindi, okay lang sa'kin. Kasi nasanay ako sa simpleng buhay." Aww, such a nice guy!